Tim’s voice is provided by Ryan Ochoa. 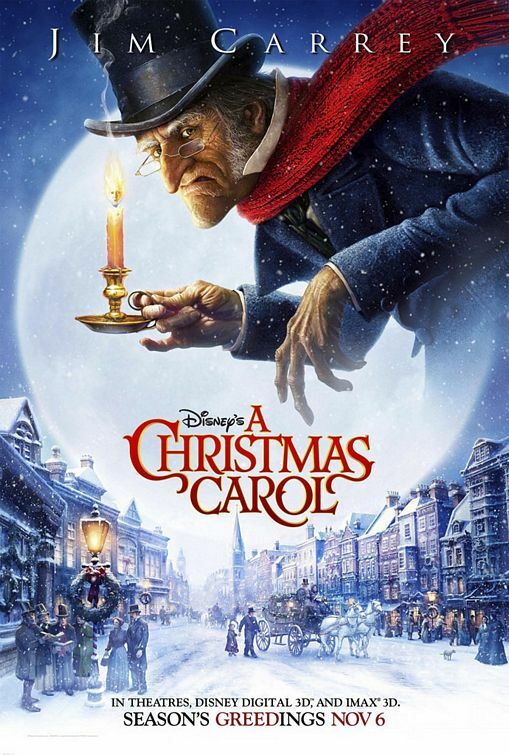 I already mentioned in my ‘Family Movies I Like that Others Do Not’ post that the Disney 2009 version of a Christmas Carol I really enjoy even though many others do not. Hopefully here I can explain a little bit more thoroughly why it works for me even if it is not perfect. The biggest difference is this is the only stop motion animated version so it has the feel of an animated film with the realism of live action. For what is basically a ghost story I think it works very well. I love the scenes where we are flying through London although some go on a bit too long (As I have said I have a weakness for characters flying in movies. I almost always love it) .The colors are bright and the way it uses shadows and light is very beautiful. Another big difference is this version tries to stay extremely close to the text. There are passages such as the men joyfully shoveling snow off the rooftops that is almost never included but it is here. I have never seen a version that includes this but it is crucial to understanding the message I believe Dickens meant behind the story that not just shutting out Christmas, but rationalizing away Christ made Scrooge cold. That is such an important moment in the story and almost never included. Anyway, other differences is that 6 actors portray most of the characters Jim Carrey ( who plays Scrooge remarkably straight), Gary Oldman, Colin Firth, Bob Hoskins, Robin Wright Penn and Cary Elwes. All are very good in their differing roles. I mean the rooms get colder when he enters. He is a “squeezing, wrenching, grasping, scraping, clutching, covetous old sinner” (again making the religious fall a part of his bitterness and anger). I actually think this version captures that Scrooge extremely well. It is perhaps a more enjoyable movie when we think of it as telling a ghost story and less of a Christmas story. They include Marley’s jaw coming off and ignorance and want is dark and quite scary. Strengths- As I said the closeness to the book is a real strength. 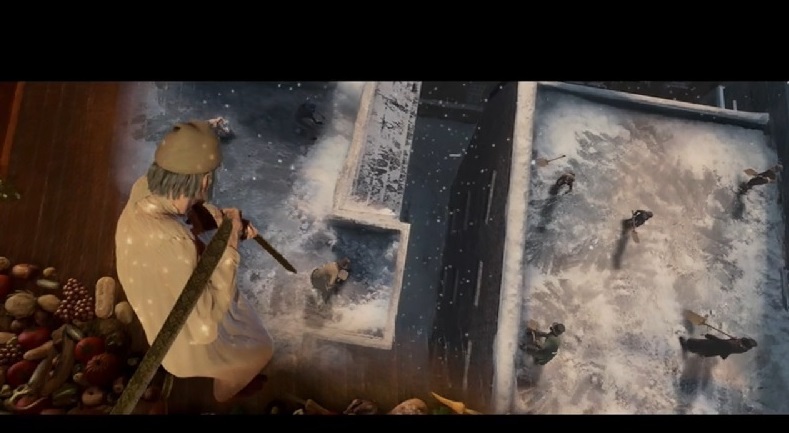 I also like the performances and I know some hate the stop motion look but I think it is beautiful. The music by Alan Silvestri is wonderful including the closing credits song by Andrea Boceli- God Bless Us Everyone. I wish more people had seen it because I would have loved to see what Zemeckis could have done with other classic stories like Jane Eyre using this medium. There are many moments which the film gets right that few do. I love that it is Tiny Tim’s declaration of Christ that first moves Scrooge. Nothing else has but as soon as he hears Bob talk of Tim he worries and begins to feel again. A lot of versions skip over this line trying to appeal to those of all faith but it is a loss in my opinion because can a nice pleasant holiday really be enough to get someone to change? 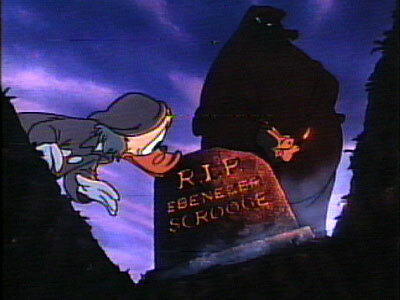 No it is a higher religious conversion, a higher meaning to life and goodness, that prompts Scrooge to repent his ways. I also like the way the appearance of all 3 spirits is very close to the descriptions in the book. This and the Muppets I believe come closest to the ethereal quality of Past. 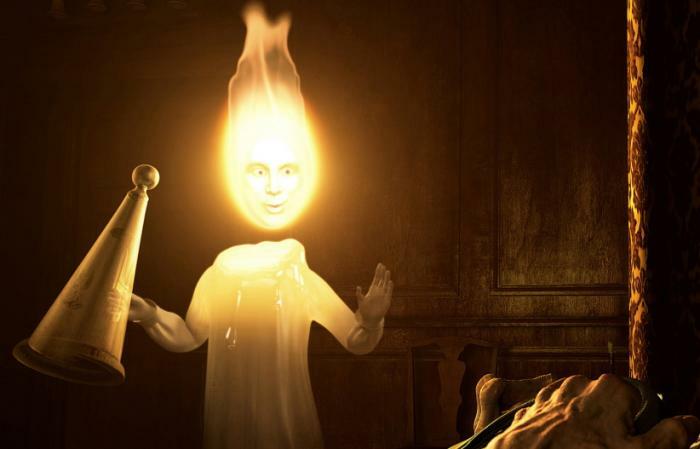 He looks like a candle, which is creative. The ending is good when Scrooge see’s his body on the bed and is desperate for some sense of feeling at this death. Then we see the couple who is grateful the death gives them more time to pay back their loan (something often skipped) and then the Cratchit’s mourning the loss of Tim. Weaknesses- Trying no doubt to appease modern viewers they do spend a bit too long in segments zipping through London. Particularly at the end when they are chased by black horses carrying a hearse it goes on too long and gets old. I typically fast forward that segment. 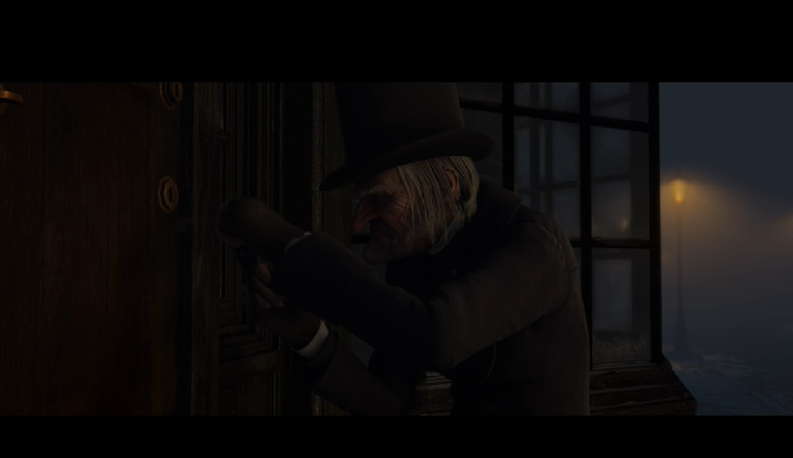 Also I don’t see why for the pawn shop scene Scrooge needs to be shrunken down with a high pitched voice. Another ploy I suppose to appease modern viewers. It can be pretty dark and scary for kids so it will depend on your child’s tolerance for those kinds of films. The scene where Present dies is like no other version. It is very scary but I think it is cool. Like I said if you look at it as a ghost story (which it is) like Corpse Bride or something like that than it is less upsetting. But it is the area where the movie takes chances. 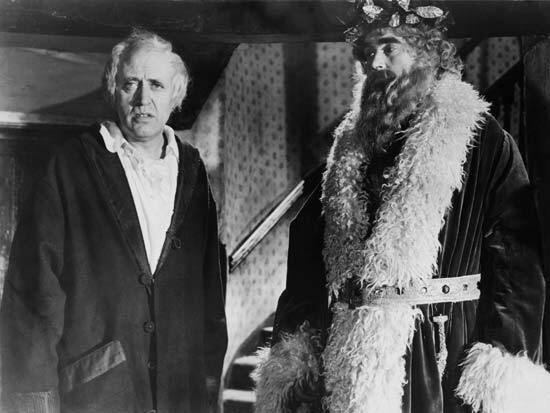 It embraces Christmas Carol as the ‘scary ghost stories and tales of the glory of Christmases long, long ago’. And I know for some who aren’t as in love with the book as I am the strict adherence may be a problem. They want a more nuanced, softer Scrooge than the book gives us. It quotes a lot from the text and makes no attempt like in Muppets or other versions to explain things in a modern way. Before beginning this project I asked around social media and my friends what their favorite version of Christmas Carol is. 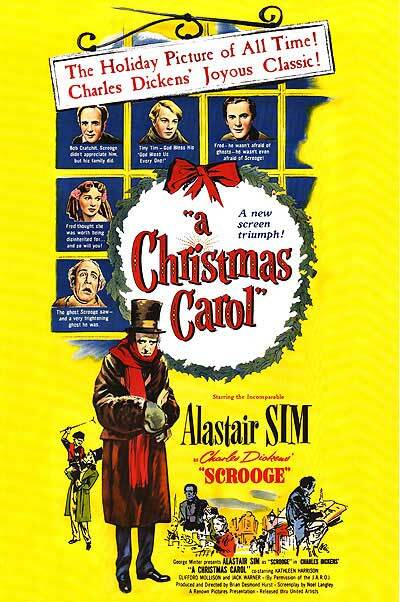 Some mentioned Muppets, Scrooged or other alternative versions but as far as traditional tellings Alistair Sim’s 1951 version came up the most. It is without a doubt the most critically lauded and with good cause. I would certainly rank it in my top 5. Before beginning the review I wanted to speak out against the colorized version I saw at my local library. Those colorized versions of classic black and white films are an absolute atrocity. 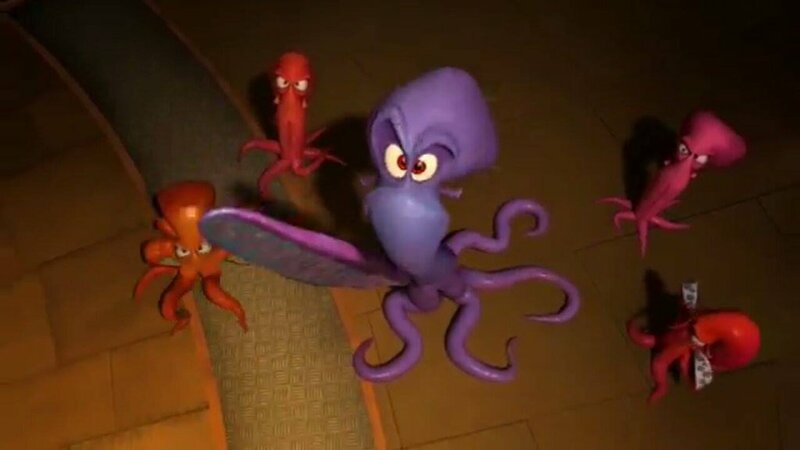 It looks terrible, like a pastel crayon was put to the film and ruin the gorgeous lighting and shadows we only get with black and white. I’d rather you not watch the movie at all than watch a colorized version. 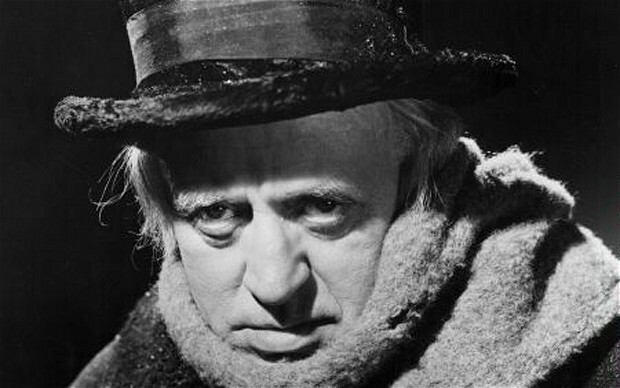 Scrooge- As I said Alistair Sim is Scrooge in this version. He was a comedic British actor and evidently at the time Dickens films were all the rage. Leonard Maltin does a fascinating introduction to the version I watched where he said David Copperfield, Great Expectations, Old Curiosity Shop and more had all been done and are considered masterpieces. I will definitely be looking up those films because the shots looked gorgeous. 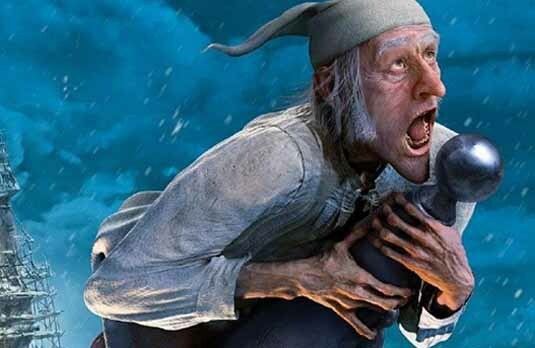 A comedic, yet still serious, actor like Sim is perfect for Scrooge because it creates a subtle performance that is hard to get when it is just anger, no wit behind the barbs and attacks. He is excellent at resisting yet being moved by the visits all the way till Future. He feels he is too old to change and should just be done away with rather than try. That felt like a very human response. Now we have to remember that the original text is a novella and so when taken to the big screen it is going to need some fleshing out in certain sections. Each version adds to it in different ways and so far I haven’t seen a version that felt outrageous or so off keeping with the story that it angered me. In this version we spend a lot of time with Past played by Michael Dolan. 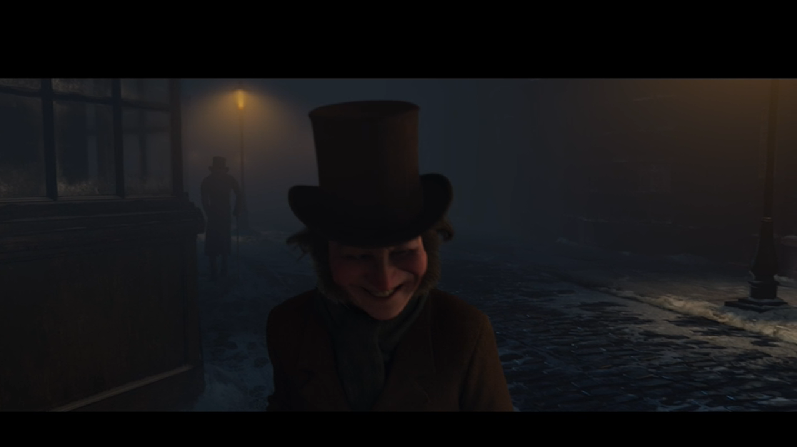 We see Fan who is older than Scrooge in this version. 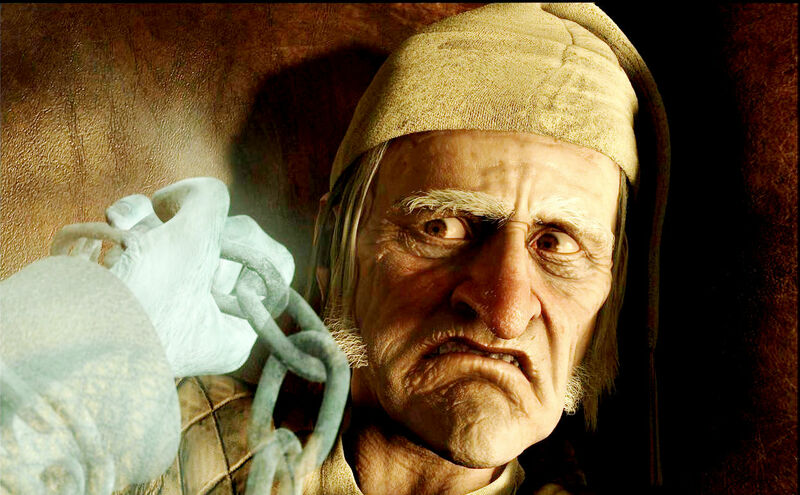 Scrooge’s Mother died in childbirth, which is why his father hates the sight of him. There is a moment when Scrooge realizes he has done this same thing to Fan’s son and it is devastating. We see Fan rescue Scrooge and then on her deathbed Scrooge storms out before he can hear her pleading with him to watch over her boy. Again, another devastating moment very well portrayed by Sim. We also get the Fezziwig’s and the girlfriend this time named Alice. Some do not care for a man named Mr Jorkin played by Jack Warner. He woes Scrooge away from Fezziwig and then embezzles money from the company, only to have Scrooge and Marley rescue the business and claim 51% of ownership as a result making ‘Scrooge and Marley. The reason I do not have a problem with this is because the book does not tell you how Scrooge went from Fezziwig to losing Belle and being consumed with money. We just know a new love has captured his heart and that he ‘fears the world too much’. Something had to happen to have made him fearful. He was a businessman so it is natural to assume he did business with all kinds of unsavory characters, especially the further down the line he got. In fact, he compromises his judgement working with Jorkin once and as is often the case once leads to another, to another. He alone is still responsible for becoming the man he becomes. 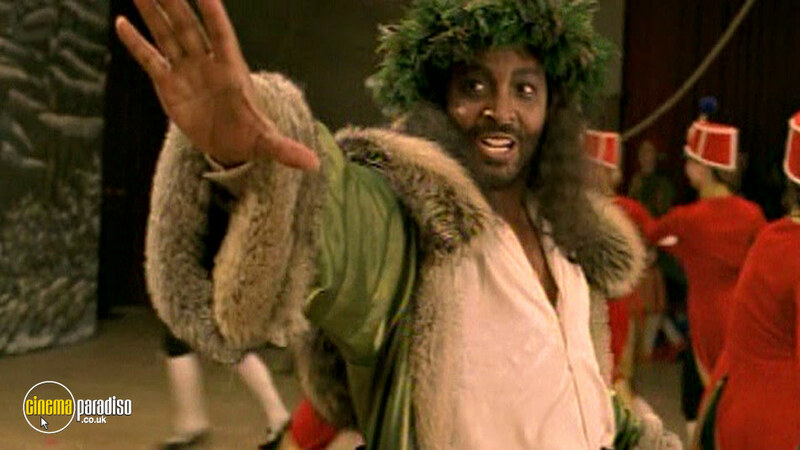 There are after all other men including Fezziwig who chose to not take the Jorkin bait. So no that doesn’t bother me. In fact, I found it an interesting take on the story. Like I said something has to have happened to have made him grow cold to the world. The rest of the tale is pretty standard. They do make a bigger deal of Mrs Dilber who is his charmwoman (servant). She is one of the women who sells his things in the pawn shop scene and was played by a well known actress Kathleen Harrison who is very funny in the crazy scrooge segments (and so is Sim). Strengths- All the acting is wonderful . Sim is great. I love Mervyn Johns as Bob Cratchit, and Michael Hordem is my favorite Marley. 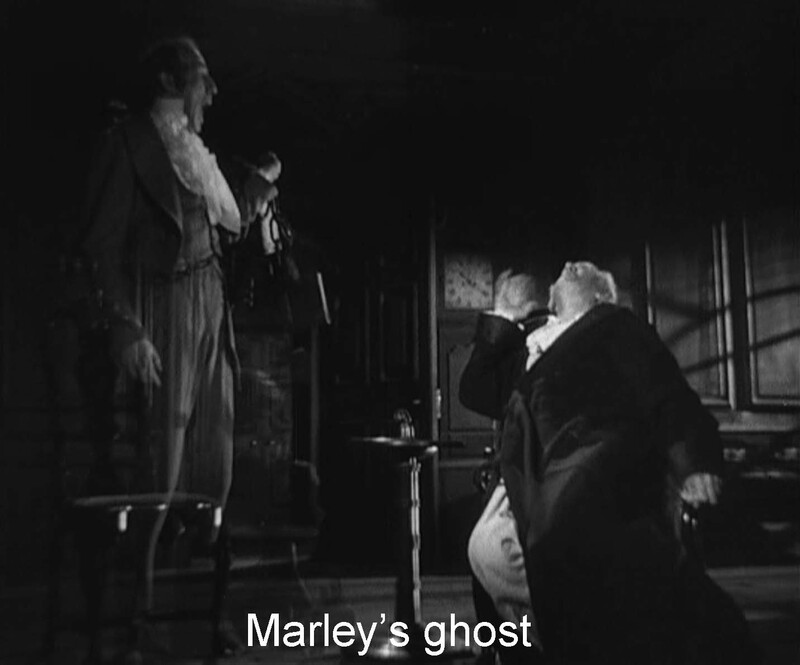 The scene of Marley’s ghost is so well done. The music by Richard Addinsell is perfectly paced to build momentum towards our reveal. The special effects of the era still look good and I love the way Marley looks tired and worn down. It’s like every word is an effort. This version also remembers the Christian element to the novella. To Dickens, Scrooge just hasn’t ignored a pleasant holiday but he has ignored Jesus Christ and His gift. 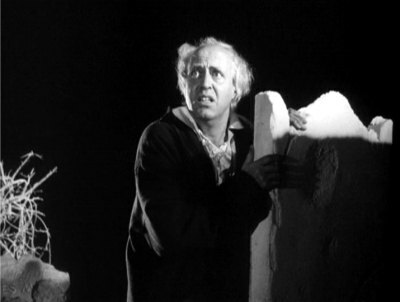 At least to me, the book is so clear that Tiny Tim remembers who died on the cross and his foil Scrooge does not. 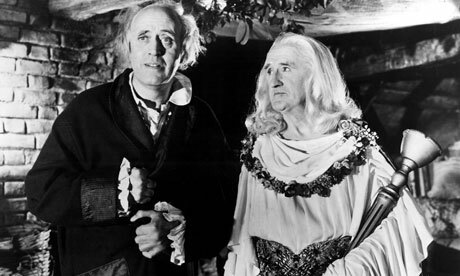 Present tells Scrooge “‘the child born in bethlehem. He does not live in men’s heart one day a year but in all the days . You have chosen not to seek him in your heart; therefore, you shall come with me and seek him in the hearts of men of goodwill”. That’s a message so often forgotten in most versions. Because of the religious themes there is a real sense of repentance not just remorse at the end. As a Christian I find the ending very moving and definitely puts this version at the top of my watch list every season. 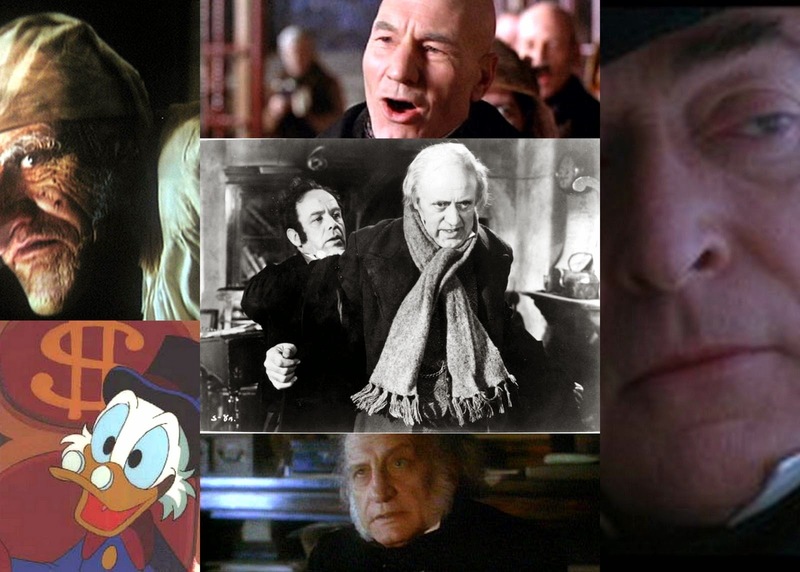 Like look at this shot where we see just Future’s hand and then the look of horror on Scrooge’s face. It is stunning. The cinematography is uniformly strong with gorgeous shadows ,lighting and atmosphere. They never go for the easy angle or uninteresting shot. It reminds me of watching a Hitchcock film, that rich in cinematography and direction. The acting is great all around and like I said the music is one of the best with carols coming at just the right moments (to emphasize the religious themes of repentance and atonement of Christ using carols). Weaknesses- There aren’t that many. But if I had to nitpick the past section maybe goes on a bit too long but it’s only an 86 minute movie so not really. The Cratchit’s are great. Tiny Tim is great. The scene with Alice as an adult at the poorhouse is very moving. All in all a definite holiday classic that is a favorite of most film lovers and casual holiday moviewatchers alike and for good reason. So I have made it my mission to watch all the major animated theatrical releases this year and as we are nearing December there were only 2 left in the docket- Penguins of Madagascar and Song of the Sea (which hopefully will play by me in December). 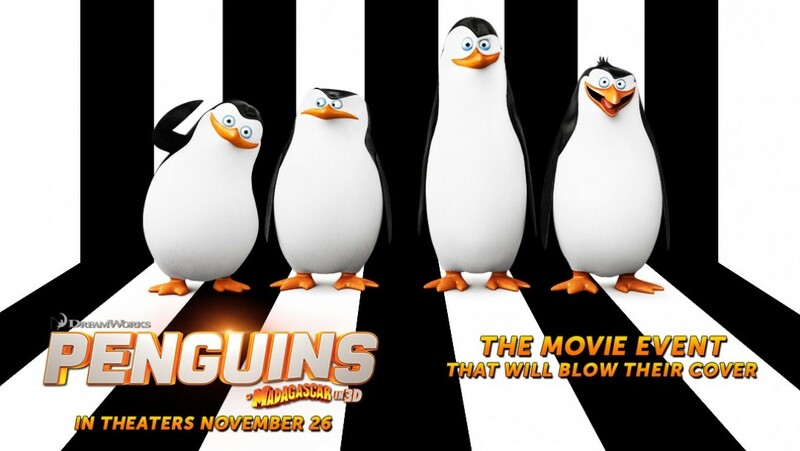 I debated whether to see Penguins because I actually have not seen any of the previous Madagascar films. The first one came out when I was just home from my Mormon mission and wasn’t really in a movie-going mode yet. Then I didn’t hear great things and so I never bothered to see any of them. (I am not a big Chris Rock fan and I really dislike the Shrek movies so not much appeal. But I had set the goal to see all the animated movies and my favorite critics over at What the Flick said they laughed their heads off so I decided to go and check it out. And you know what? It’s actually really funny. It reminded me of the first Naked Gun movie. Just one joke after another and they all made me laugh. It’s not as inventive or creative as Lego or Mr Peabody and Sherman which also made me laugh but I was thoroughly entertained by the film and the kids around me were laughing long and hard. 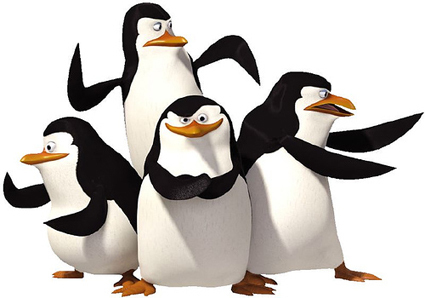 Like I said, it is a spoof on spy movies with the penguins Skipper (Tom McGrath), Kowalski (Chris Miller), Rico (Conrad Vernon) and Private (Christopher Knights) on the case to track down an Octopus named Dave (John Malcovich) who is trying to kidnap the penguins because all the zoo patrons think they are so cute. 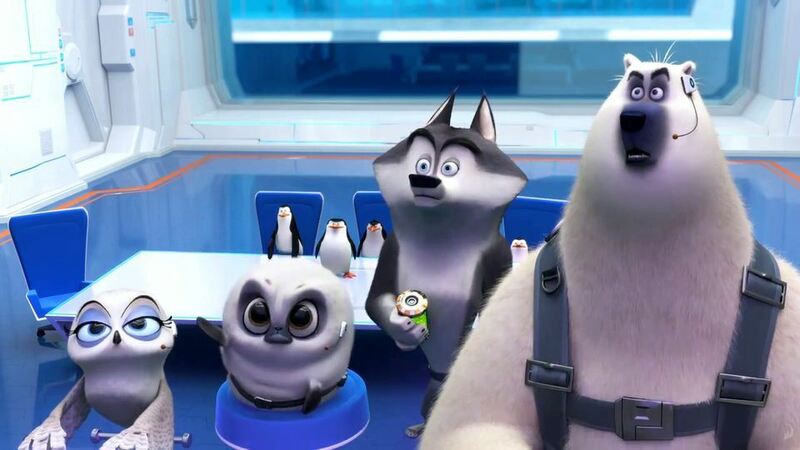 Our intrepid crew is aided by a band of high tech super spies called the North Wind led by a wolf named Classified who is voiced brilliantly by Benedict Cumberbatch (not that many celebrity voices in this, which was refreshing). They go through all kinds of hijinks but the plot is really secondary as is the animation, which does the job it needs to do. With a movie like this you either think it’s funny and laugh or you don’t. Everyone has a different sense of humor, so all I can say is that I laughed a lot. So job well done! It also doesn’t have any of that cheeky ‘wink wink’ tawdry humor other Dreamworks films have (like Shrek). I really hate that. Most of the jokes are word humor like when they make fun of Dave’s ordinary name for a super-villain or when Dave skypes in and his audio doesn’t work. It’s a very tightly written funny script. I’d be curious to know if you all found it funny. Like I said, humor is so subjective and there isn’t a ton else to recommend this film. Let me know what you think! This makes it the 12 animated film I’ve seen out of 2014 and so far I’d rate them- Lego Movie, Tale of Princess Kaguya, Big Hero 6, Boxtrolls, How to Train Your Dragon 2, Mr Peabody and Sherman, Book of Life, Penguins of Madagascar, Rio 2, Planes: Search and Rescue, The Nut Job, Legends of Oz. I’ve thoroughly enjoyed the year! Only 2 I didn’t enjoy on some level. Hope you have too. 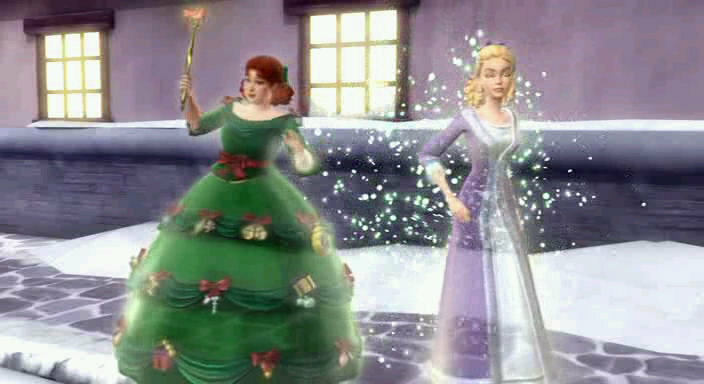 Ok everyone get your girlie on and let’s do Christmas Carol Barbie style. I mentioned the Barbie movies in my post Consider Your Audience. They, along with the Tinker Bell movies, do a good job producing content for the vastly underserved girl 4-8 market. 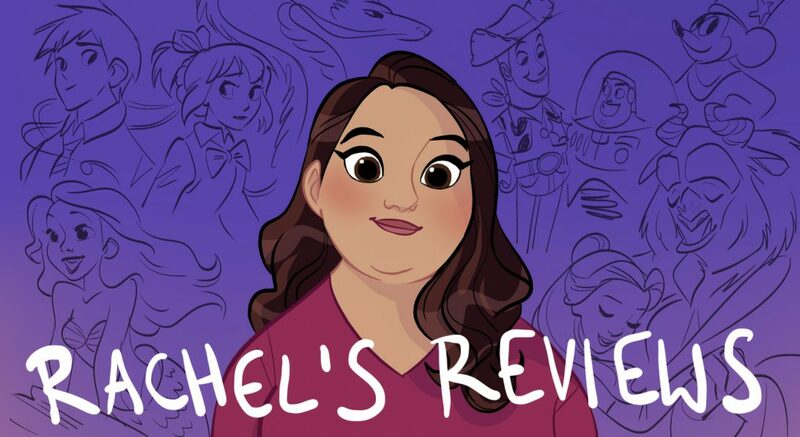 A lot is made for both boys and girls and of course you have the occasional Frozen and Tangled but I’m glad these series exist for girls looking for good stories they can enjoy. 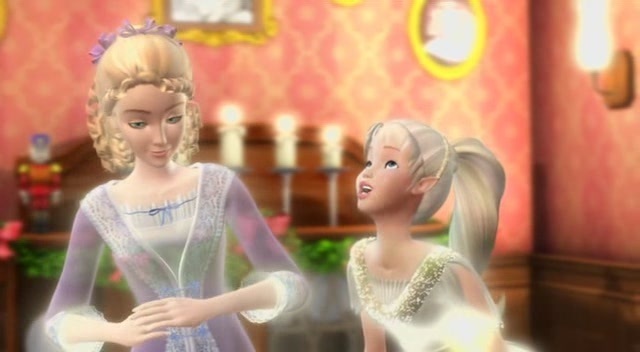 Barbie in A Christmas Carol is the 14th Barbie film and was made in 2008. 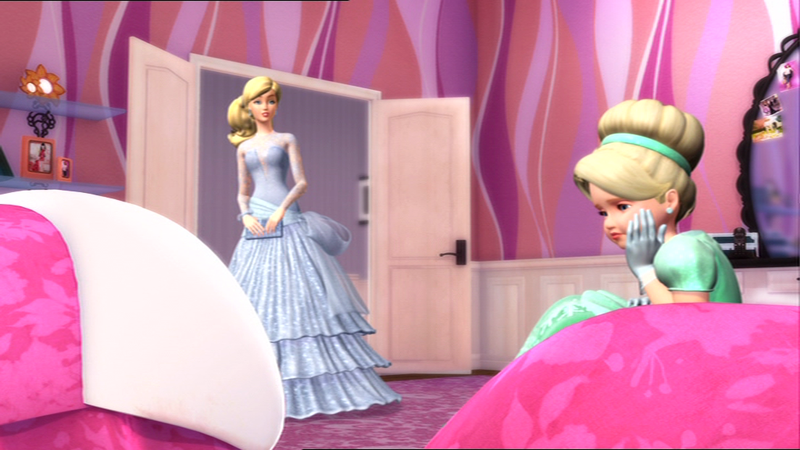 It does not have the production value of some of the earlier films like Barbie as Rapunzel 2002 or Barbie of Swan Lake 2003. 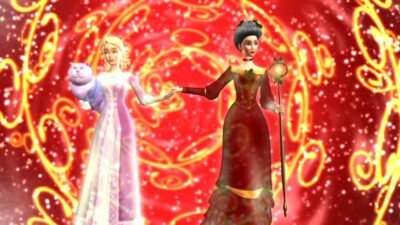 My favorite is Barbie in the 12 Dancing Princesses 2006. But this is passable animation for a direct to video release. It’s the very stark, low cost CG (and I would prefer hand drawn) but I didn’t mind it. The voice work and music is always good in the Barbie movies and is here; although no big names except Kelly Sheridan returns as Barbie. They take a few different touches to make the story work within the Barbie world but unlike Smurfs the essence of the story is there. Differences: Obviously big difference is it is in Barbie world and all the key characters are women. We start out with little sister Kelly not wanting to go to the charity ball and wanting to stay at home (who has a charity ball on Christmas day but nonetheless). 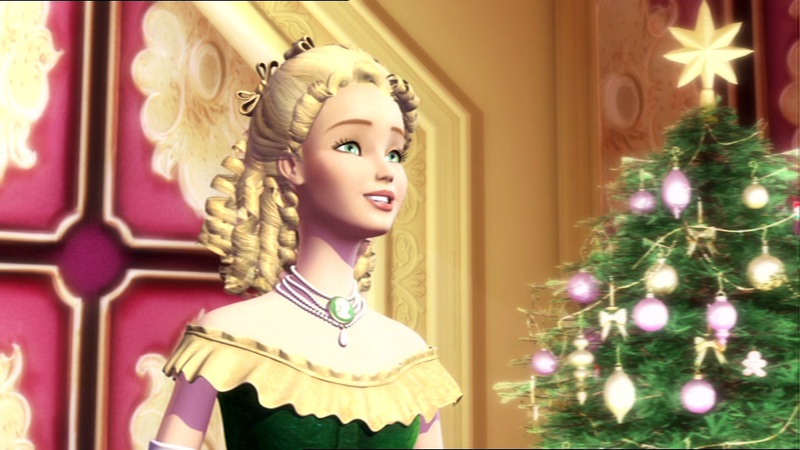 Kelly says she hates Christmas so Barbie tells her sister a story about a Victorian opera diva named Eden. 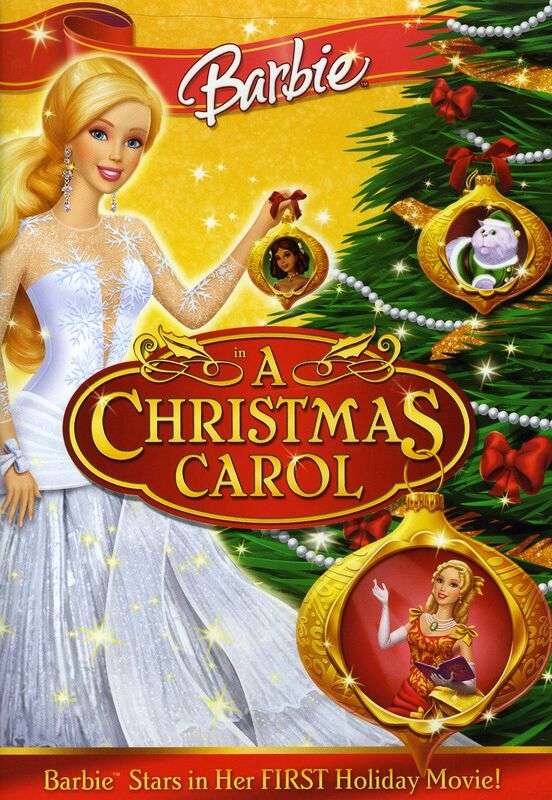 Barbie then becomes our narrator for the Christmas Carol story. Scrooge: Eden Starling is a diva opera singer who has been raised by her Aunt Marie to practice and shut the world out. She has decided to make her team, including her best friend Catherine (Cratchit in the story) work over Christmas for their new show. She has airs and doesn’t respect anyone even her best friend who she accuses of working on another show on the side (Catherine is a costume designer). Aunt Marie has a saying “in a selfish world, only the selfish survive” and this has become Eden’s mantra. So it is no doubt a surprise when Jacob Marley is in fact Aunt Marie. I thought it was kind of clever that Marie does not have cash boxes on her chains but mirrors. She tells her she was wrong about the world being selfish and that it is good and loving. Past comes and is a big Eden Starling fangirl which I thought was kind of clever and funny. She takes her back to her childhood when Marie was making her practice on Christmas but she sneaks out and spends the day with Catherine. Marie is definitely a beast and a pretty chilling character. It was a little bit of an interesting take to have Jacob and Cratchit characters in this story so intimately a part of the entire story not just present. I liked that. Present takes Eden to see her colleagues angry at Eden for making them work and throwing tomatoes at her. At first she is outraged and then she see’s Catherine going to her other show. It turns out it is a choral program for an orphanage. One of the orphans is named Tammy (Tiny Tim of course). They all love and idolize Eden. Future shows Eden as a poor washed up singer. She fired her team for being late on Christmas and then had one disaster after another including a hypnotist that was funny. Catherine has become a famous designer but is bitter and has accepted the ‘in a selfish world, the selfish succeed’ mantra. I thought that was an interesting take to have Cratchit become Scrooge in the future. Never seen that before . She can’t bare to see her friend this way and realizes she needs to change. Strengths- I think fans of the series will enjoy this entry. It’s about as good a job as could be done in this world with this story. 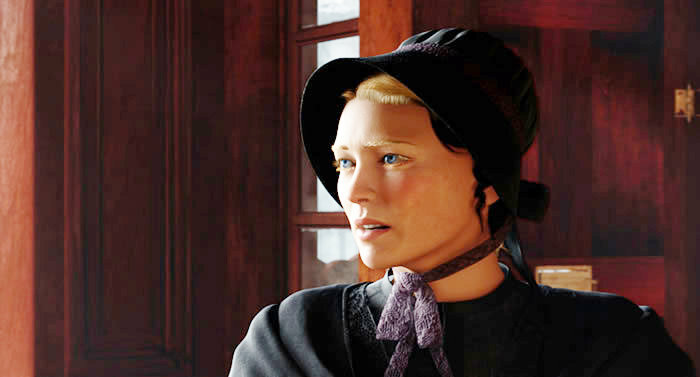 I liked the voicework and a few of the touches like Aunt Marie and the message about selfishness were effective. The idea of a diva barbie fits and I enjoyed it. I’m glad they went with traditional carols instead of new songs and they are all performed well. I also thought the idea of Marley being basically Scrooge’s mother and Cratchit being his best friend (girls in this version of course) was interesting. 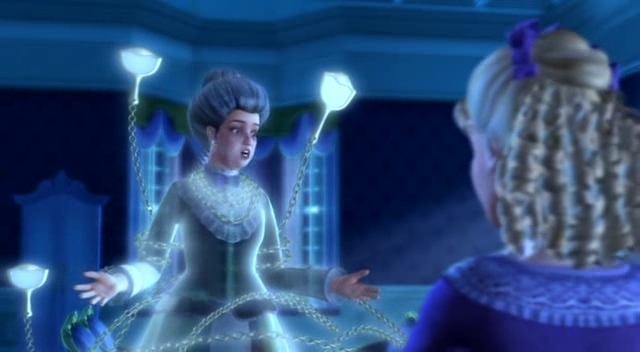 I also liked the design of Aunt Marie with the mirrors on the chain. Weaknesses- the animation is strictly on a direct to video level. I am sure some people would find it very garish and ugly. It is kind of jerky and can be unpleasant at times to look at, but only in moments and then it is good again. It is certainly not a traditional take on the story but most of the components are there (Marley, Cratchit, Tiny Tim, Spirits) but I’m sure purists would have an issue with it. There are better Barbie movies but this is in the top half I would say. It is made to target 4-8 year old little girls and I think it does its job quite well. So if you have a girl in that age range sit down and watch it together. You will enjoy the holiday memories! I will start out this post by saying I have no nostalgic feelings towards The Smurfs. The TV show aired from 1981-1989 and I knew about it but my family didn’t have a TV for spurts when I was young and most of the time I had chores on Saturday morning when it aired. That said, I think the designs are cute. I went into the recent movies with an open mind as I always try to do and boy was I underwhelmed. I would rather watch Dinosaur, my lowest Disney canon film, than either Smurf film again. What makes them so especially putrid is not the terrible animation, the horrible live action merging, dumb plot, or the cringe-worthy puns. All that is awful but the constant product placement for Sony products is so distasteful. 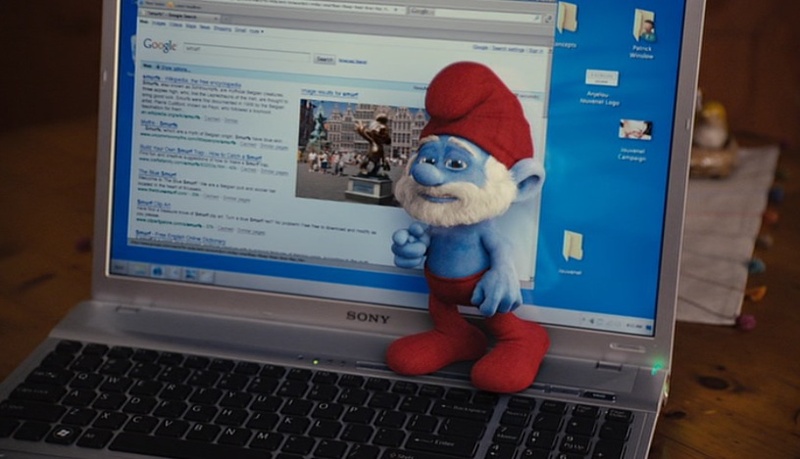 I am aware that product placement has always been a part of children’s programming but I don’t recall anything being as overt and constant as in The Smurfs movies. It is in almost every scene. 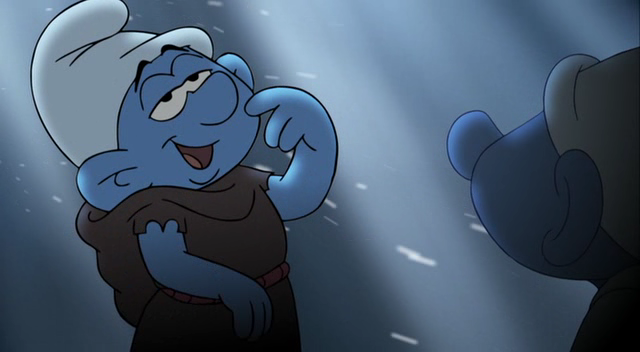 Anyway, the Smurf movies will always go down as 2 of the worst movies I’ve ever seen because of all the horribleness and the product placement so naturally I wasn’t very excited to watch Smurfs Christmas Carol but at least it was short unlike movies 1 and 2. And my friends it’s not very good but it is not as bad as the movies. This is what I like to call a Shoney movie. When I was a girl we would drive by this chain restaurant called Shoney’s and my grandma would say ‘Shoney’s, it’s not that bad’. We would all laugh because why go to a restuarant that is ‘not that bad’ when you can go some place that is actually good. Same with this movie. Why watch it when we’ve got great holiday films for kids like Muppets, Mickey, Charlie Brown etc. But let’s talk about the short. There was one fascinating aspect to it. Recently I had a vigorous debate about the values of hand drawn animation vs computerized. I said that the variety we seem to be getting in plots, characters since the advent of CG makes me feel positive toward the movement. 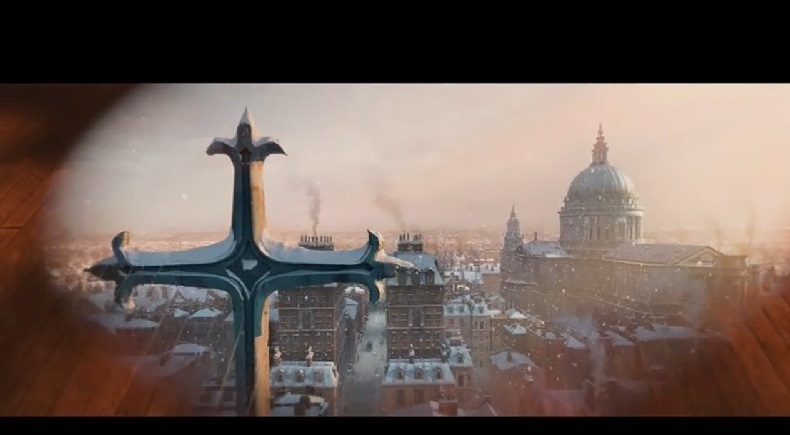 There are absolutely gorgeous CG films. Here’s what Smurfs Christmas Carol taught me. Good CG can hold it’s own along with good hand drawn but bad CG is infinitely worse than bad hand drawn. Differences- To say this is a lose adaptation of Dickens novel is being generous. There is no Cratchit’s, no Jacob Marley. The only similarity is a grumpy man and 3 ghosts. We start out with Grouchy Smurf being upset with Christmas and he doesn’t want to put the star on the communal tree. This upsets all of smurfdom and Christmas appears to be ruined (although why someone named Grouchy surprises the smurfs when he is grouchy is a bit of a head scratcher). We learn that Grouchy has always wanted a hanglider but every year he gets a hat (which let’s be honest a white hat every year would make me grouchy!). When Grouchy storms out he goes to his mushroom and Papa Smurf gathers with Brainy, Smurfette and others and makes a potion that will teach Grouchy a lesson. When Grouchy falls under the spell all of the sudden it turns into 2D and it looks a million times better. I don’t think I have seen a switchover like that in a long time and it was shocking. Doesn’t this look so much better than the image above? Smurfette is Past and we learn about Grouchy’s disappointment over the hats. 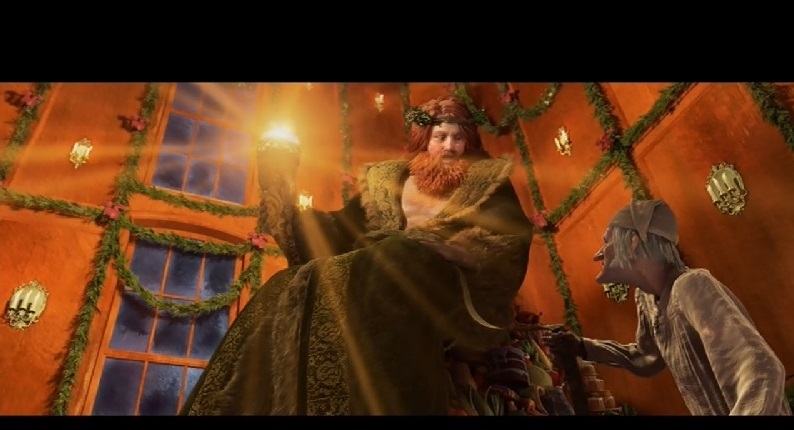 The movie condemns him for this but why does he need a hat every year? But evidently this is an incredibly selfish desire on his part to want something different. 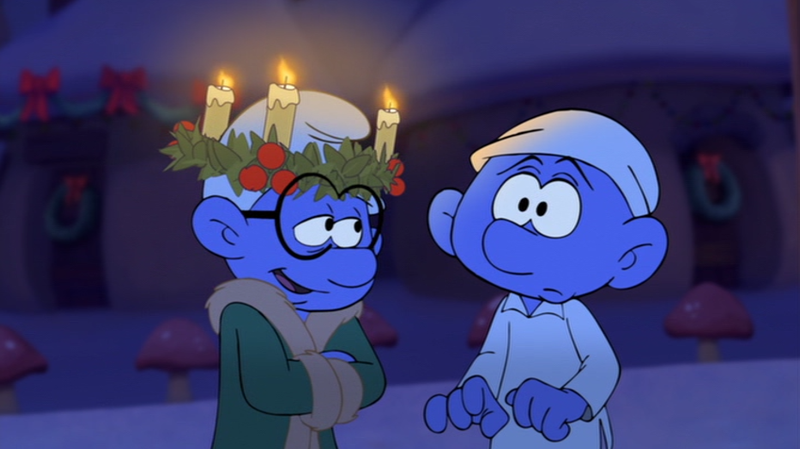 Brainy Smurf is Christmas Present and we learn that Papa Smurf actually individualizes the hats for each Smurf. So it is super selfish but it still doesn’t really seem selfish to me. It seems like a lazy gift giver to do the same thing every year. Next is Heft Smurf as Christmas Future and this becomes oddly It’s a Wonderful Life where everything in Smurfdom is affected because Grouchy didn’t put the star on the tree. 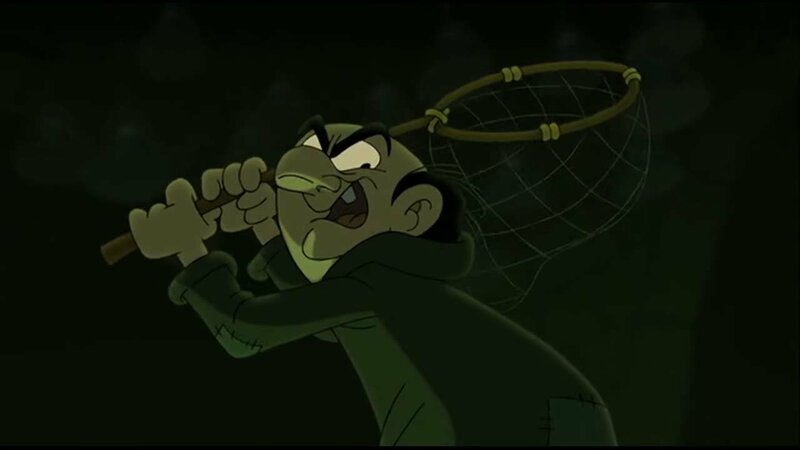 Gargamel has even captured everyone. Gargamel is about to put Grouchy in his vat that will take way his smurf essence and as he enters the water he says ‘I’ll change’. So everything is made right and we are back to ugly CG and it turns out Grouchy’s hat is a hang glider after all…Groan. Strengths- Honestly seeing the difference in the hand drawn and CG was really interesting for me. 2 different studios did both parts and you could tell. The animation is Shoney’s level at best but the Smurfs are cute so fans will probably enjoy seeing them. The voicework is pretty good but other than that not much I can recommend. The story with the hats actually makes me feel sorry for Grouchy. Give him something else for goodness sakes. What kind of strange commune is this that every gift has to be the same every year? 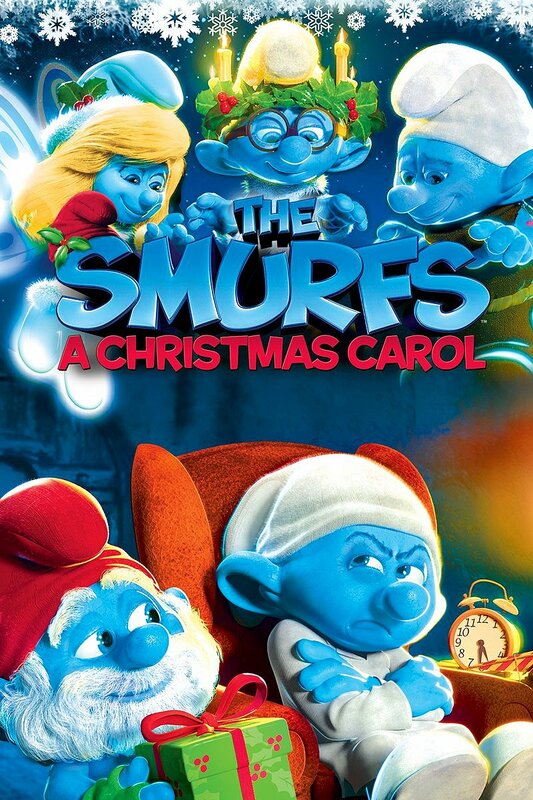 Overall I recommend it only for Smurf fans. It’s Shoney level but there is so much better out there. I have the day off work today so I figured I would post a couple reviews, watch some holiday movies! 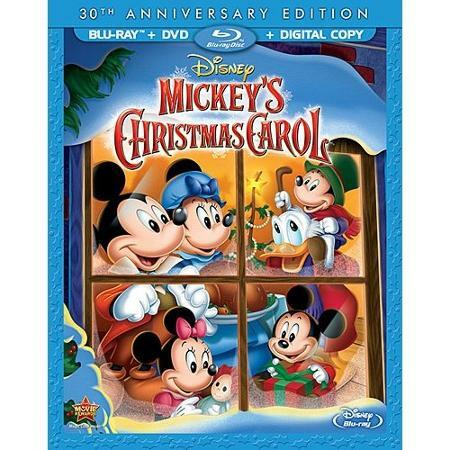 Now for one of my favorite Christmas Carol versions and the best animated version to come out, Mickey’s Christmas Carol. This is an animated short (about 20 minutes) that was released in 1983 with the rerelease of The Rescuers. It was the first theatrical appearance of Mickey Mouse in 30 years. (I would like to see another Mickey appearance soon!). Originally it was a radio play by Disneyland Records and you can tell because the script is very well done. Scrooge is a bit of a smart-allick here and a lot of the witty dialogue helps temper the scary moments while still keeping the tension, and basic redemption effective. Scrooge- Given they already had a character named Scrooge McDuck who is famous for skiing on his gold this was a no brainer. 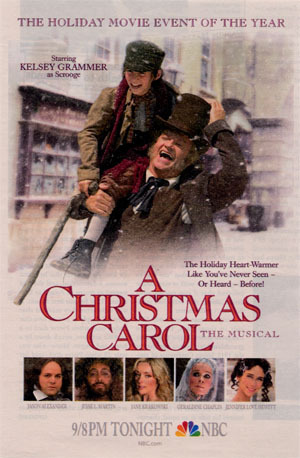 Alan Young is wonderful as Scrooge and gives a lot of humor to the lead vocal. Differences- Obviously the biggest difference is we have our Disney characters anthropomorphized as the title characters of Christmas Carol. They pull a lot from Fun and Fancy Free and Ichabod and Mr Toad which I guess is understandable given they have a lot of characters that fit a Victorian era. It’s interesting they went the Victorian route. A lot of the other cartoon versions such as Smurfs or Flintstones take the story into their worlds, but I like that it feels of period. 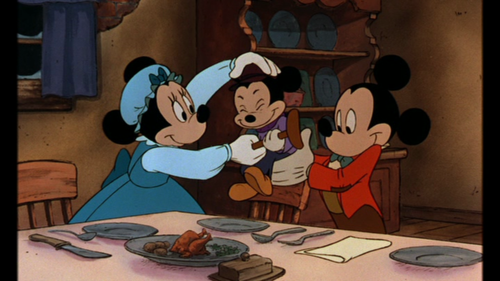 The introductory scene is fairly standard featuring Mickey as Cratchit, Donald as Fred (Donald just makes me smile every time I see him), and Rat and Mole as the benefactors. Scrooge’s response to them is classic. “You work all your life to get money and people want you to give it away”. It is interesting because if his life work were painting people wouldn’t expect him to give those away for nothing but a life work of money is. There is no ‘let them die and decrease the surplus population’ which is perhaps a bit harsh for this version so good choice. 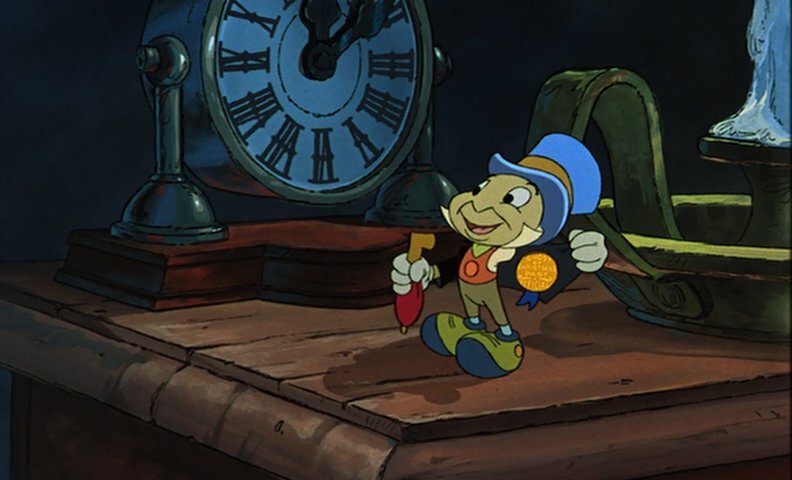 With Past played by Jimminy Cricket. Their initial interaction is very good. So that becomes a theme of the program. Is kindness of any use? Later from Present we hear of ‘generosity’ and Present tells Scrooge he’s never given anyone a reason to be generous to him. That’s an interesting take on the message of Christmas Carol. The world is good and full of light but we have a responsibility to accept that light. With Past we go right to Fezziwig’s (no childhood or other scenes) and it is mainly to introduce to Belle played by Daisy (and I think the only time Daisy is not with Donald). We then get to his counting house and I like that Scrooge is sentimental when he first see’s it, even excited. This is before he see’s himself foreclose on Isabelle’s honeymoon cottage for being an hour late on the payment. It is dramatic enough to quickly explain to kids a complicated economic process of mortgages while getting the core emotion right. Present takes him to see the Cratchit’s only (no Fred) and Scrooge is immediately taken with Tiny Tim. The Cratchit’s poverty is shown in a quick yet effective way with a turkey the size of a canary. That’s simple for kids to understand.Makes the point about suffering and poverty without dwelling on it too much for kids. Present leaves him in front of the Cratchit’s house and he asks Future what will happen and Scrooge’s ‘Oh no. Spirit I didn’t want this to happen” is a very well delivered line. The finale is very effective with Scrooge falling into the grave and pleading for change but I don’t think too scary for kids. 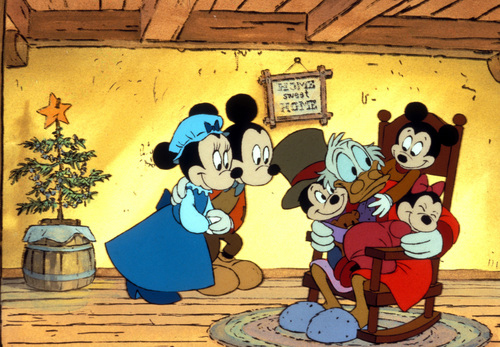 Strengths- Some may want to discount a Mickey Christmas Carol as more of a lark but I actually think it is a good adaptation, and it is great way to introduce small kids to the story. All the voice work is tremendous, and I like Scrooge’s sarcastic attitude. 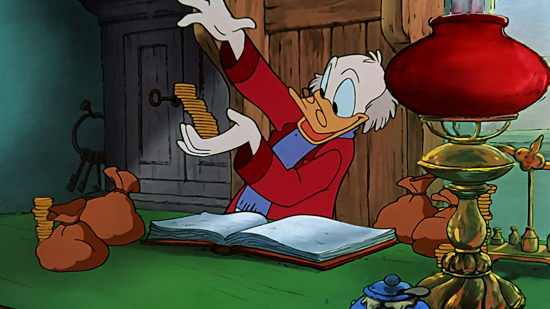 He gets the most glee out of his money and jingling the coins together than many other Scrooge’s. 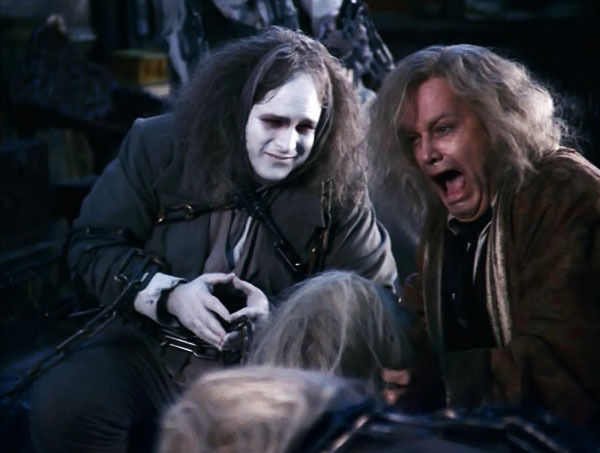 Mickey is of course great as Cratchit and the ghosts are all effective. The script is the real standout. It’s very sharply done and teaches a lesson about kindness and generosity without getting to heavy handed(ignorance and want aren’t shown, no decrease surplus population). 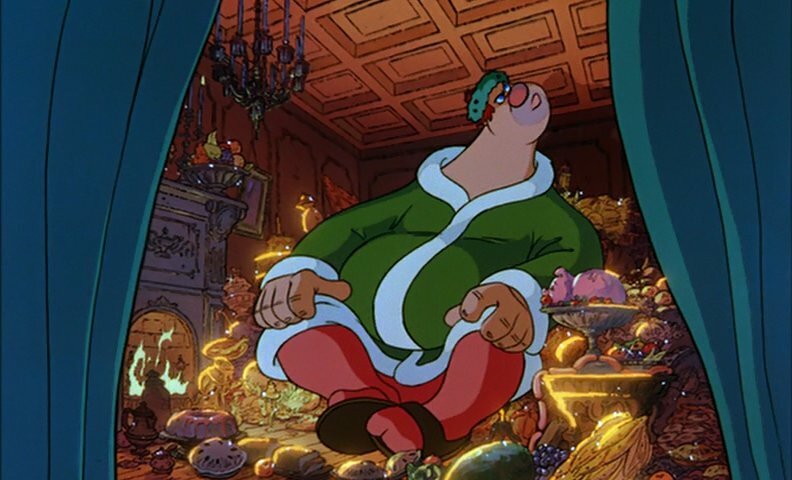 Instead of Scrooge being a bad man (not caring if people die) he is merely someone who isn’t allowing people to be kind to him, not allowing others into his life. It’s a slightly different take that I like. As I said the finale is very well done. Crazy Scrooge is very good with him coming back to get his cane to be fully dressed in his pajamas. They do a good job throughout of painting a complex picture in one dramatic moment (like the honeymoon cottage bit tells kids exactly what they need to know quickly so it doesn’t feel like a mean-spirited film). Weaknesses- I honestly could have seen this be a feature film. A few scenes could have been fleshed out even more. 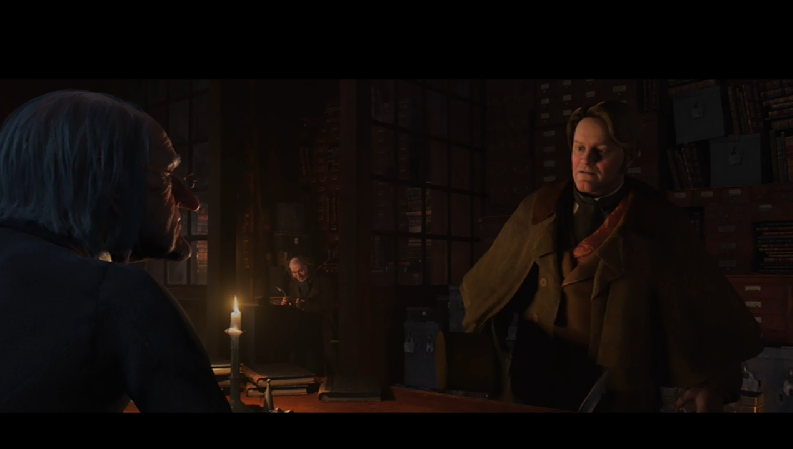 I could have seen Scrooge look in on Fred playing games in present or Scrooge as a child in the past segments. (Muppets does both very well). Goofy is maybe a bit of an odd choice for Marley. He’s so loveable and silly it is hard to picture him as a bad guy. Perhaps a Disney villain might have worked better? But I suppose it helps relieve some of the scares for little kids. The music is kind of a corny Christmas song but it works. Certainly one of the best and that’s not just nostalgia talking, and like I said my favorite animated version. The recent blu-ray release of it is gorgeous. The HD looks bright, clear and beautiful. It includes 5 animated shorts that are very entertaining. 1. Yoldelberg- 2013 but done in the style of Mary Blair for the program Mickey Mouse, which I am intrigued to watch. 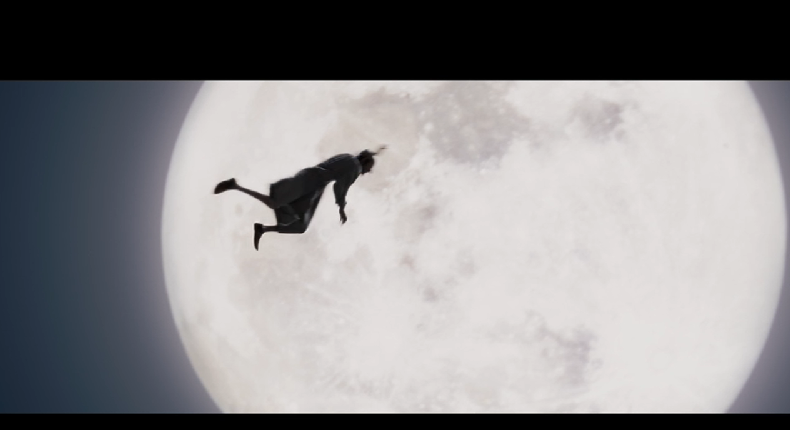 Paul Rudish animates it beautifully. 2. The Hockey Champ- 1939, early Donald teaching Huey Louie and Dewey how to play hockey. I love Donald! 3. Pluto’s Christmas Tree- 1952, Pluto battles with Chip and Dale as they tease him from inside Mickey’s Christmas tree. 4. The Art of Skiing- 1941, The first of Goofy’s ‘how to’ series. 5. Corn Chips- 1951, Chip and Dale try to steal popcorn from Donald and it gets out of control. I didn’t realize Chip and Dale were a part of so many shorts? 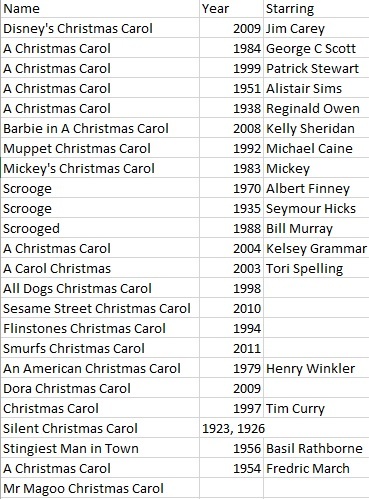 As you are watching the blu-ray you can also pause for sing along segments of our favorite carols. It would be nice if they had a behind the scenes or other bonus features considering its a 30 year anniversary blu-ray but all in all I’m satisfied with the restoration and blu-ray. I mentioned in my last post I would like to organize these Scrooge reviews but the truth is they will end up being jumbled up because I get access to them at different times depending on when they air, are available from the library and other opportunities to watch come up. 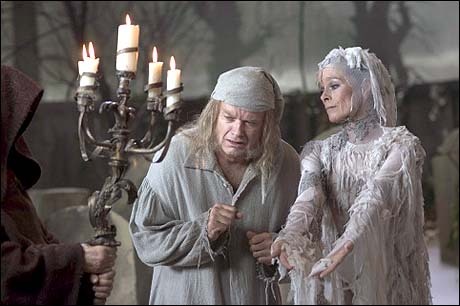 So I had the 2004 musical version called A Christmas Carol: A Musical on my DVR and gave it a watch last night. It was my first time viewing this version. I’ve decided to not give grades for these movies but to just make note of the differences, strengths and weaknesses in each adaptation. So, let’s talk about what makes this version special! In this version we get a musical in the style of Oliver! Music is by Alan Menken with lyrics by Lynn Ahrens and it is very solid songs. 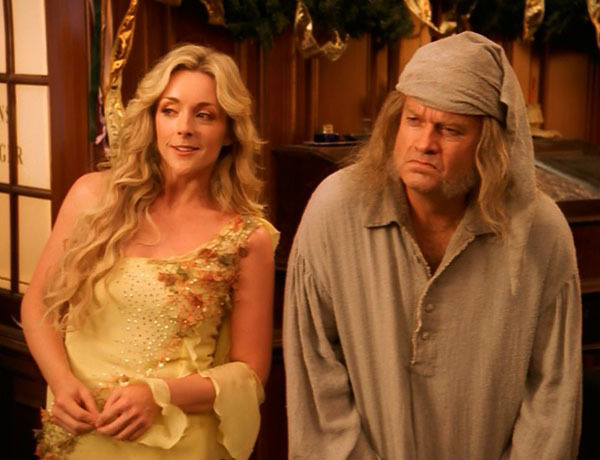 Scrooge- Kelsey Grammar, he’s pretty good although the hunched over, old impression feels like something that would work better on the stage. His singing voice is very good. Opening sequence which is usually at the counting house is at the stock exchange. The Jacob Marley scene is unique. Instead of just Jacob you have an array of ghosts that do a number similar to Tevye’s Dream in Fiddler on the Roof. 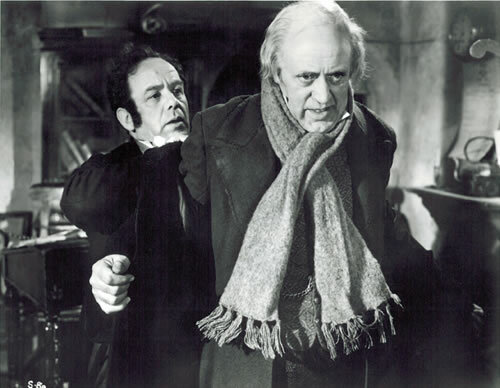 They also integrate the story of Dickens father going to the debtor prison as part of Scrooge’s story. 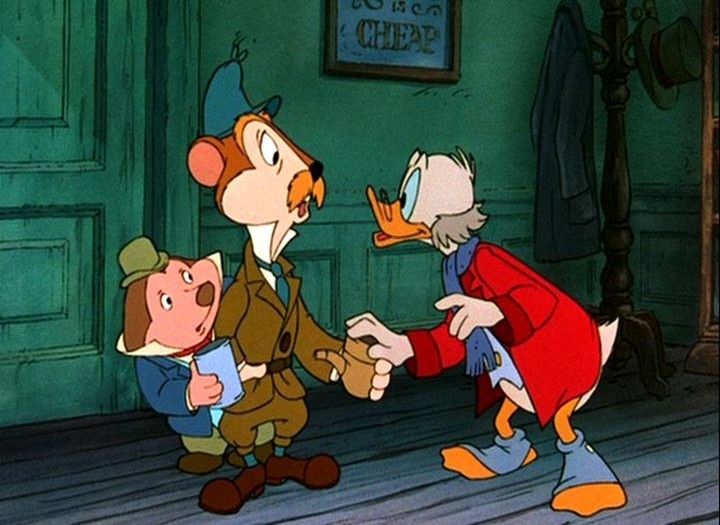 There is a scene in a courtroom where Scrooge’s father tells his son after being convicted ‘save your pennies. Make your fortune and keep it’. We see Scrooge working in a shoe factory as a child which no other version had done which I’ve seen and that actually makes sense. They use the Cratchit’s less than other versions and have Scrooge’s mother say the ‘God Bless Us Everyone’ line. Other differences are you see Marley die which I don’t recall in other versions. Scrooge actually seems upset by this. This is the only version I know of where Ghost of Future is a woman and not a grim reaper type. Another difference is Scrooge refuses to give Fezziwig a loan just before his girl Emily (Jennifer Love Hewitt) breaks up with him. 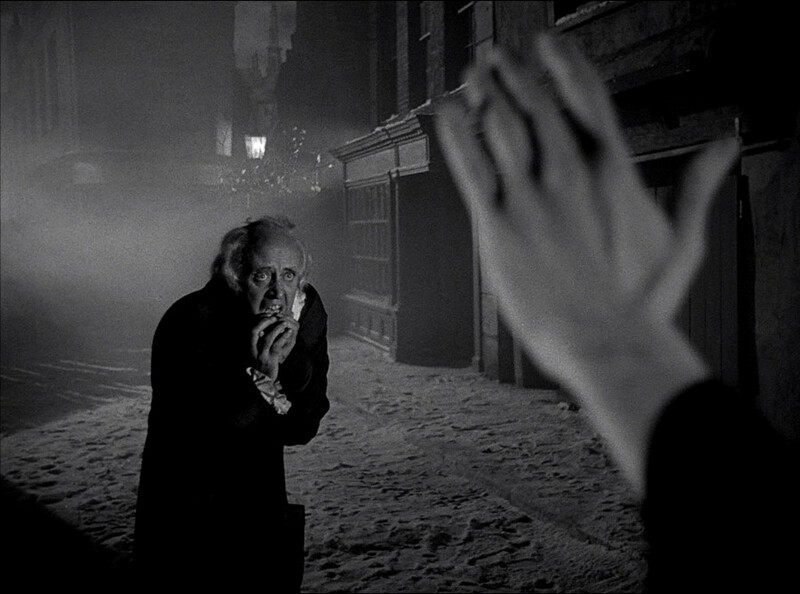 That was a very effective scene with Scrooge’s mentor realizing how cold his pupil has sunk. Strengths- The music is a strength. I didn’t like every song but for the most part they are solid musical numbers that have the Menken flair (lyrics aren’t always great but it’s tough to be original with Christmas music). All of the singing is excellent. Grammar has a lovely voice as well as Martin, Krakowski, and Gower. There is also a good chemistry amongst the cast. They all felt like a community, supporting one another (or not in the case of Scrooge). I surprisingly thought Jennifer Love Hewitt was effective in her brief scene as Emily. The special effects with the ghosts, and various changes to the story with Scrooge’s father and refusing Fezziwig’s loan were interesting and effective. Also I thought the unique Ghost of Future was good. Nice to see some dialogue and personality in that character. Weaknesses- Jason Alexander is miscast as Marley. I don’t know if it is just weird for me seeing George Costanza as Marley or if his performance is that off. It just didn’t quite gel. Another issue is the makeup is very badly done and the lighting makes characters look kind of gaunt and pale, even Martin who is supposed to be alive and boisterous had sunken eyes and an emaciated look about him. It lessened the effects of Ignorance and Want because everyone already looked like them. The finale is moving and it is nice to see Fran again but I missed the desperation and real intensity the scene normally has. It felt more like an inspirational group number than a pleading call for mercy. Overall, I enjoyed the version. It has it’s technical issues with the makeup and lighting, but I thought the songs were good, performances pretty good and the changes in the story for the most part worked and were interesting. So, if it is on your dvr give it a watch.